May you find great value in these inspirational Louisa May Alcott Quotes from my large datebase of inspiring quotes and sayings. but the kingdom given them isn't worth ruling. Father asked us what was God's noblest work. Anna said men, but I said babies. Men are often bad, but babies never are. men have to work and women to marry for money. It's a dreadfully unjust world. Girls are so queer you never know what they mean. of his wits for the fun of it. especially ambitious young men and women. and prove that you understand the worth of time by employing it well. and life will become a beautiful success. and the great charm of all power is modesty. as that is, in my opinion, the best way to settle the woman question. and I don't think any one will deny us. for conceit spoils the finest genius. 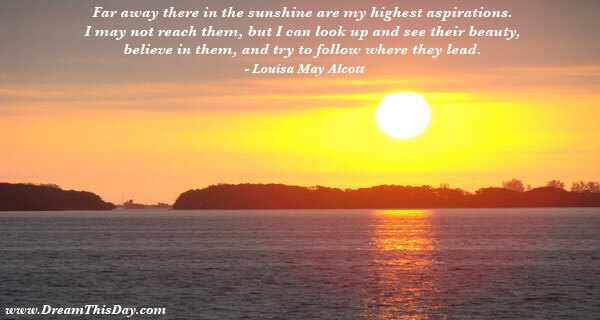 Thank you for visiting these Louisa May Alcott Quotes and Sayings - Quotes by Louisa May Alcott.